Ah, the venerable Jaguar XK engine! This beautiful 6 cylinder double overhead cam engine was produced by Jaguar from 1949 all the way until 1992. While enhancements were made along the way, the basic engine design remained virtually unchanged throughout the entire production history. 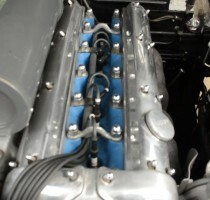 Jaguar designed this engine to be easy to maintain and repair. This includes the design of the overhead camshaft mechanism, which allows minute adjustments to each cam for timing purposes, and, more importantly, allows both cams AND the entire head to be removed without having to disconnect the timing chain.